L-R: John C. Reilly and Will Ferrell in “Holmes & Watson”; Giles Keyte/© 2018 CTMG, Inc.(NEW YORK) — Christmas Day movie-goers clearly preferred Jason Momoa’s Aquaman to the debut of the Will Ferrell and John C. Reilly’s comedy, Holmes & Watson. Aquaman scored a further $22 million Tuesday, bringing its domestic total since its first-place debut last Friday to $105 million. Add that to the $400 million or so the film has already earned overseas and Aquaman‘s global gross now stands at over half-a-billion dollars. Aquaman‘s Christmas Day performance isn’t a record, but it’s right on up there. Star Wars: The Force Awakens, which opened December 18, 2015, holds the record for Christmas Day earnings, with $49 million. 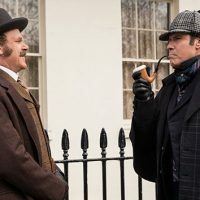 Not faring at all well is the Christmas Day debut of the new Will Ferrell-John C. Reilly comedy Holmes & Watson. The duo’s third film as top-billed co-stars, and the first since 2008’s Step Brothers, placed fourth at the Christmas Day box office, with a disappointing $5.4 million. Generally abysmal reviews didn’t help, even though the studio didn’t allow the press to see the Sherlock Holmes spoof before it opened — never a good sign. Holmes & Watson is hoping to make between $18 and $20 million before the week is out.